Vault Boy - his history, why he's giving the thumbs-up and his female counterpart, Vault Girl. Vault Boy, the official mascot of Vault-Tec Corporation, appears in their advertisements, manuals, training films and nearly every other product Vault-Tec produces. Because Vault-Tec's influence extended across the entire United States, the cheerful, chubby, blonde-haired, blue eyed iconic figure can be found virtually anywhere a Vault-Tec vault was built. He was also intended to appear in some issues of the “Hell's Chain Gang” comic published by Hubris Comics, but production of the series was cut short with the Great War. The image of Vault Boy is so thoroughly a part of 23rd century culture that it might as well be the official symbol of nuclear war and its aftermath. During the years before the Great War, Vault-Tec billboards advertised their unique product, the massive underground vaults designed to survive a nuclear attack. 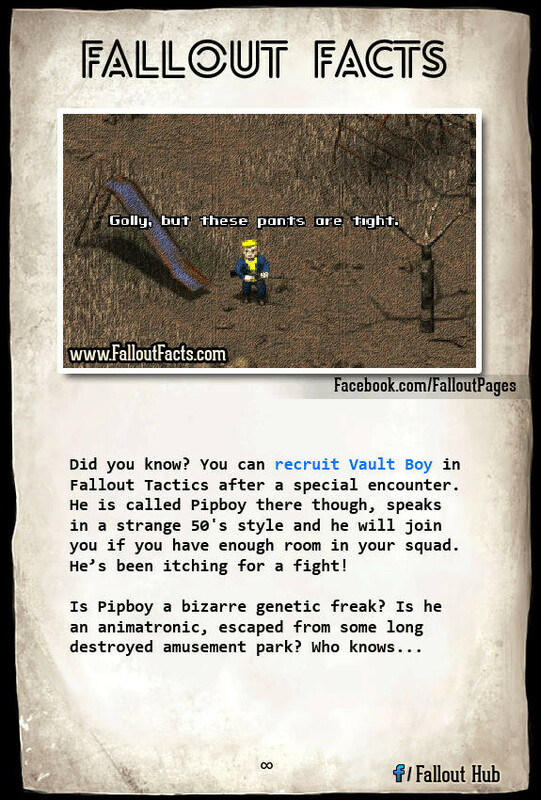 The image of Vault Boy could be found everywhere, exhorting American citizens to register for their place in a vault - even though in the end, only a few thousand were ever chosen, and only a fraction of those were actually among the real survivors. Vault Boy was the most visible propaganda piece of Vault-Tec Corporation. The Pip-Boy wearable computers issued to vault dwellers use Vault Boy's image for a variety of purposes in their user interfaces. The user's health and well-being is indicated by an icon of Vault Boy, with status bars reading out the relative damage currently sustained by various body parts; illness, addiction, and even radiation poisoning all have associated Vault Boy icons as well. Vault Boy has a female counterpart, also known as Vault Girl, who appears in some icons as his companion. Strangely, however, the Pip-Boys worn by female vault dwellers use Vault Boy icons rather than Vault Girl. The reasons for this oversight are not known; it could be due to storage limitations on the devices, or simple laziness on the part of Vault-Tec programmers. In his most iconic image, Vault Boy is seen smiling, with one eye closed, an arm outstretched, fist clenched with a thumb raised. This has been commonly misinterpreted as a “thumbs-up” signal to the viewer. In reality, it's an old, pre-war disaster preparation sign. Supposedly, if you were unfortunate enough to be outdoors in the vicinity of a nuclear attack, you were supposed to stick your thumb in the air. If the blast cloud was smaller than your thumb, you were outside the danger zone. 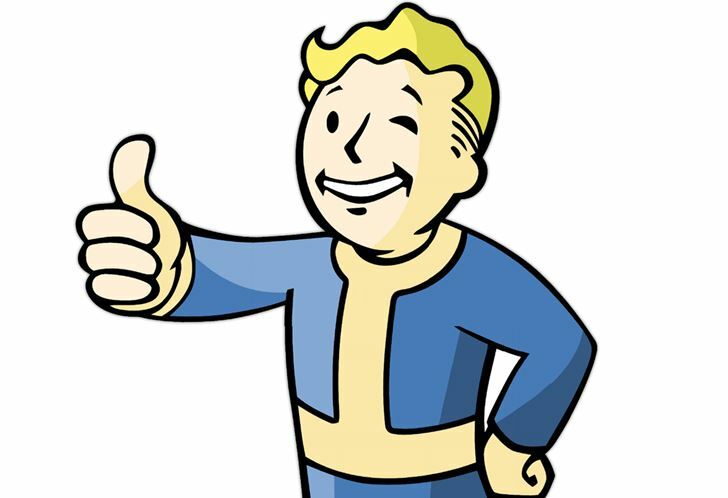 Vault Boy's cheerful image with its upraised thumb and winking eye now stands as a reminder of the futility of war, and is now more often interpreted as a symbol of encouragement by the survivors.